Shopping for Wonder Woman Pin Mates? A fantastic find for AMAZON PRINCESS™ fans! 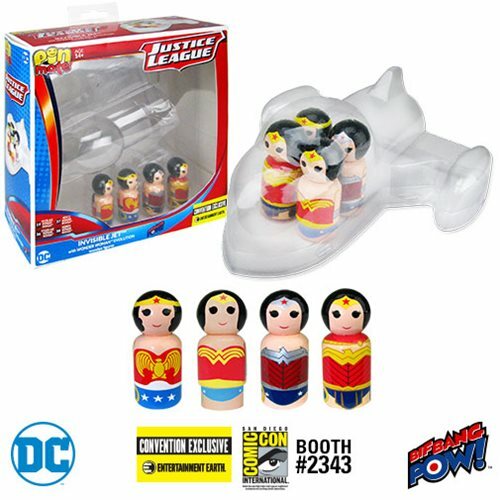 The invisible jet opens to reveal four one-of-a-kind, retro-styled, 2-inch scale wooden figures! Set includes GOLDEN AGE WONDER WOMAN™, SILVER AGE WONDER WOMAN™, WONDER WOMAN™ NEW 52, and WONDER WOMAN™ REBIRTH! Featuring highly detailed, brightly colored, 360-degree artwork. Each figure is individually numbered within the DC Comics Pin Mate™ series. Entertainment Earth Convention Exclusive! Trace the evolution of the AMAZON PRINCESS™ through this unique set of four retro-styled, 2-inch scale wooden figures and her fantastic invisible jet. Each figure in the Wonder Woman Evolution Pin Mate Wooden Figure Set of 4 with Invisible Jet is individually numbered within the DC Comics Pin Mate™ series, and they all feature highly detailed, brightly colored, 360-degree artwork. There's GOLDEN AGE WONDER WOMAN™ (#36), SILVER AGE WONDER WOMAN™ (#19), WONDER WOMAN™ NEW 52 (#37), and WONDER WOMAN™ REBIRTH (#52)… and they all fit inside the plane! Plus, as an Entertainment Earth Convention Exclusive, this set is individually numbered with the production run number on a holographic sticker. What a fantastic find for WONDER WOMAN™ fans! Ages 14 and up. Experience the Evolution of WONDER WOMAN™ with her Invisible Jet Convention Exclusive!